"ground source heat pump (GSHP) is an electrically powered system that taps the stored energy of the greatest solar collector in existence: the earth. These systems use the earth's relatively constant temperature to provide heating, cooling, and hot water for homes and commercial buildings." In Las Vegas for example, to cool a space a standard heat pump must take heat from the interior spaces and move it to a heat sink. The heat sink is typically the air outside, and the higher the temperature of the heat sink the more energy is required to operate the heat pump. With ground source heat pumps the heat sink is the cool earth starting about 5'-8' below grade. Other sources of heat sinks include domestic water, ground water, ponds or lakes, and even sewer systems. I can imagine a system that uses a pool as a heat sink thereby saving heating costs for the pool. More often this would be achieved by drilling an array of dry wells into the site and installing closed loop piping (often copper) packed in a heat conductive slurry (often bentonite) connected back to the heat pump by a system of valves and pumps. In Geothermal Heat Pumps Provide Sustainable Alternative for Architects, Russell Boniface explains energy costs for heating and cooling can be reduced by 40-70% with a properly design GSHP system. While this provides significant savings to an owner it may still be difficult to justify added up front costs of the system. Lenders and commercial leases are just beginning to take into account these energy and operational savings when evaluating the cost of these systems. In their book Geothermal Heat Pumps, Oschner and Curtis provide an overview of design and installation of GSHPs. They demonstrate that GSHPs generate 20-25% of the CO2 of standard heat pumps and obtain their energy saving from a truly renewable and secure source. A properly designed GSHP system may actually provide construction cost savings by down sizing emergency power requirements of projects like data centers and medical facilities. So you can save costs by going green! 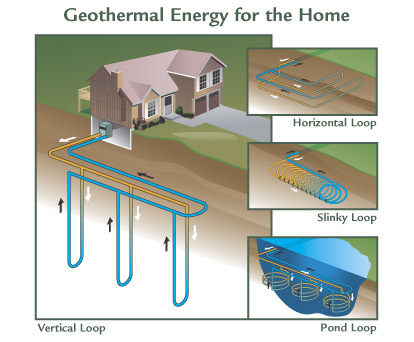 Keep in mind that the phrase used to identify this technology varies in different markets; Wikipedia redirects you to geothermal heat pump, some builders use geoexchange, and others geothermal exchange or simply gx. Also, as this technology is often new to many designers and contractors, so you should seek out experienced professionals for advice. Normally, you can find additional information at the Geothermal Heat Pump Consortium but as of this writing their website is down. This article has also published in the June 2008 issue of the AIA Las Vegas Forum Newsletter. Paul Cline, AIA is an architect and builder in Las Vegas, Nevada. He is a member of the Young Architects Forum Advisory Committee and writes on issues of community, sustainability, and innovation in design and construction.